In the United States, 133 billion pounds of food were wasted in 2010. Figure 1. Data source: Buzby, Hodan, & Human, 2014. In the USA, 133 billion pounds of the food supply available at the retail and consumer levels in 2010 went uneaten, according to a report from the U. S. Department of Agriculture. The total available food supply was 430 billion pounds, meaning that 31% of the food was lost. Retail losses represented 43 billion pounds, while consumer losses represented 90 billion pounds. The data is shown in Figure 1. The total amount of food represents represents about 387 billion calories (Technically, kilocalories. In common speech, when we refer to “calories,” we are actually referring to “kilocalories.” In the rest of this post I’m going to follow common usage, and use “calories” to refer to “kilocalories.”) The report translates this to 1,249 calories per person per day, which is about half of a person’s daily caloric requirement. These statistics have a humanitarian implication. There are many factors that would complicate attempts to deliver the wasted food to those who need it, but it would feed a lot of hungry people. Figure 2. Source: Buzby, Hodan, & Hyman, 2014. Food waste can also be thought of from an environmental perspective. Food waste constitutes about 14% of the total waste stream in America. 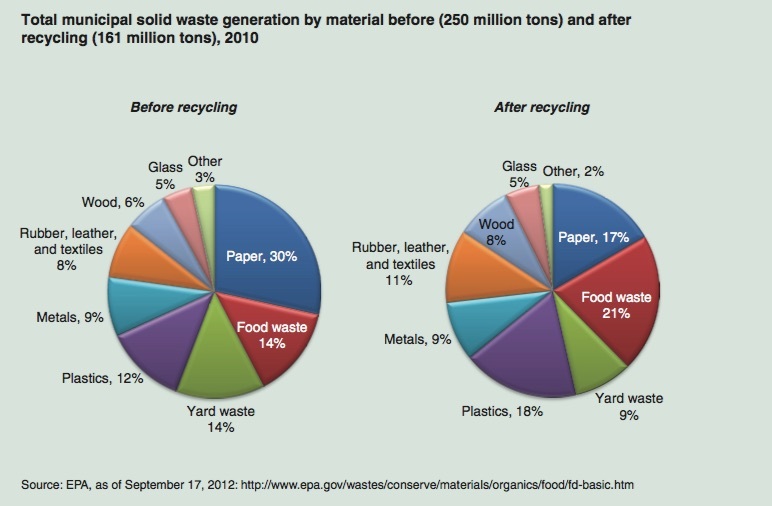 After recycling products are separated out, it represents the largest category of waste going into our landfills: 21%. (See Figure 2) In addition, though the report doesn’t go into specifics, the growing and transport of food requires the use of energy, the spraying of pesticides and herbicides, the tapping of aquifers for irrigation, problems dealing with animal waste, and the erosion of topsoil, all of which are significant environmental problems. That almost 1/3 of the product produced with these practices is wasted should be a concern to almost everybody. What are we throwing away so much of? In terms of total pounds of wastage, we throw away more dairy products than anything else (25.4 billion pounds), and vegetables are a close second (25.2 billion pounds). In terms of the percent of the available food supply that gets wasted, sugars and sweetners top the list (41%), followed by fish (39%). Figure 3. Source: Buzby, Hodan, & Hyman, 2014. Unfortunately, reducing waste is not so easy, and requires attention at all levels, including the level of the individual consumer. 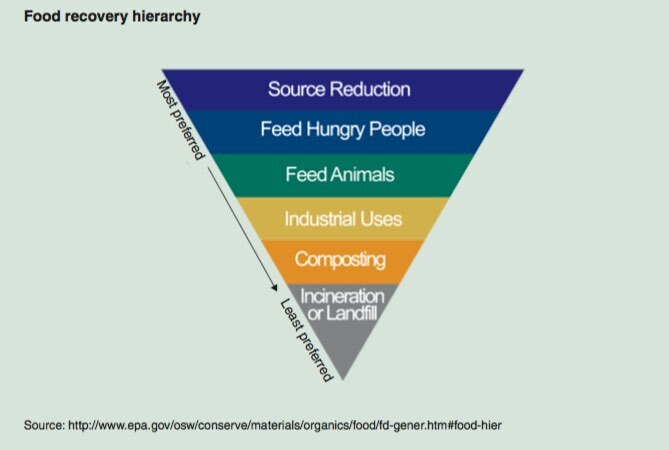 The EPA has published what they call a “food recovery hierarchy,” prioritizing different strategies. (Figure 3) Perhaps the basic first step involves the awareness that wasting food has a humanitarian and environmental cost. U.S. Department of Agriculture. Estimated Calorie Needs per Day by Age, Gender, and Physical Activity Level. Viewed online 3/3/2018 at https://www.cnpp.usda.gov/sites/default/files/usda_food_patterns/EstimatedCalorieNeedsPerDayTable.pdf. Buzby, Jean C., Hodan F. Wells, and Jeffrey Hyman. 2014. 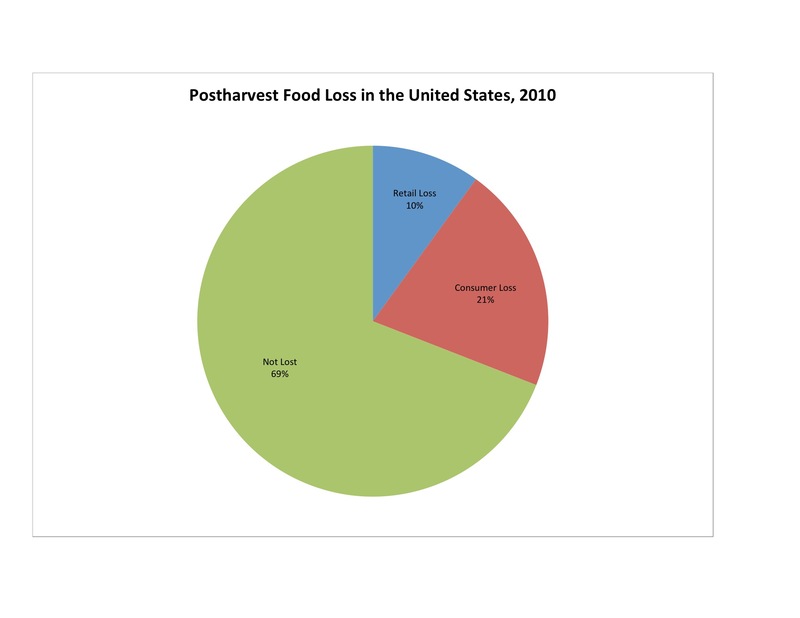 The Estimated Amount, Value, and Calories of Postharvest Food Losses at the Retail and Consumer Levels in the United States, EIB-121, U.S. Department of Agriculture, Economic Research Service, February 2014. Downloaded 1/3/2018 from https://www.ers.usda.gov/webdocs/publications/43833/43680_eib121.pdf. an unknown percentage of native invertebrate species (animals lacking a backbone, including insects, worms, and shellfish). Figure 1. 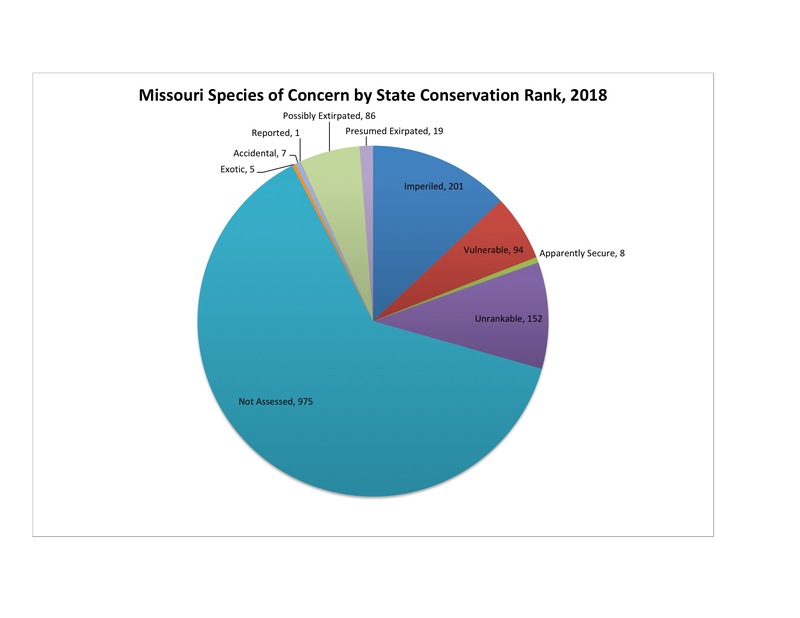 Data source: Missouri Department of Conservation 2018. Threatened or endangered species in Missouri are defined as those listed as such by the Missouri Wildlife Code (3 CSR 10-4.111), or the U.S. Endangered Species Act. There are 75 listed in the checklist. They include such notable species as the Peregrine Falcon, the Greater Prairie-chicken, and the Snowy Egret. There are many, many more species of concern that are not listed in those laws, however. The report lists 1,156 in total. Figure 1 shows the number of species by rank. (Some species carry more than one rank, thus, the total number of rankings is larger than the total number of species on the list.) Some of these species may exist in other parts of the country or the world, but some are (were) unique to Missouri. Figure 2. Data source: Missouri Department of Conservation 2018. Plants and animals tend to group together into communities where the species each fit into a niche that contributes to the health of the whole community. Weaken one and you weaken the whole community. Because Missouri’s landscape is fractured into relatively isolated ecosystems defined by soil type, sunlight, and the presence (or absence) of water, the state is home to many unique, but small communities of this kind. Many of Missouri’s threatened species live in such communities. Eighty-five such communities have been identified by the Missouri Department of Conservation. Of them, 24 are listed as imperiled (28% of the total), and 17 more are listed as critically imperiled (20% of the total). Together, that means 41 are either imperiled or critically imperiled (48% of the total). (Figure 2). Consolidated State Rules of Missouri. 2017. 3 CSR 10-4.111, Wildlife Code, Endangered Species. Viewed online 2/15/2018 at https://www.sos.mo.gov/adrules/csr/current/3csr/3csr.asp. Missouri Department of Conservation. 2018. 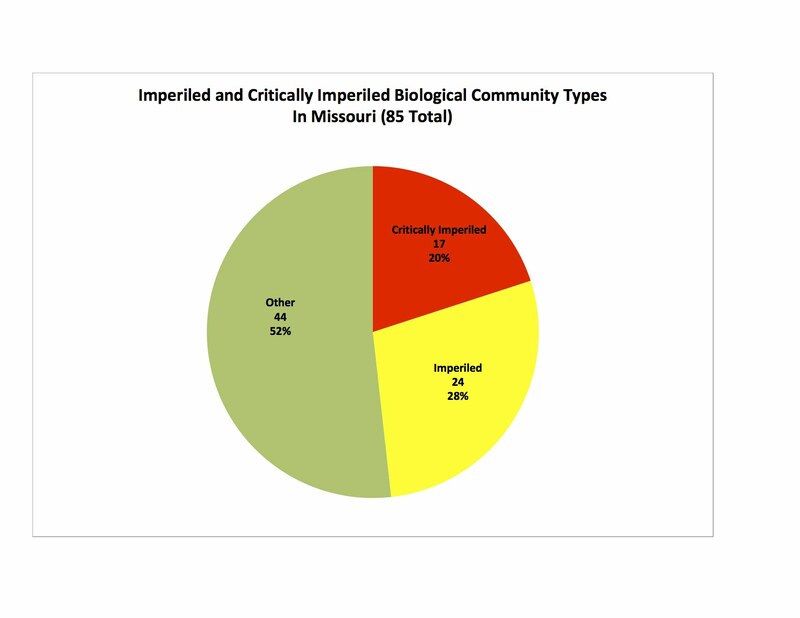 Missouri Species and Communities of Conservation Concern. Publication # SC1077. Downloaded 2/15/2018 from https://nature.mdc.mo.gov/sites/default/files/downloads/2018_SOCC.pdf. 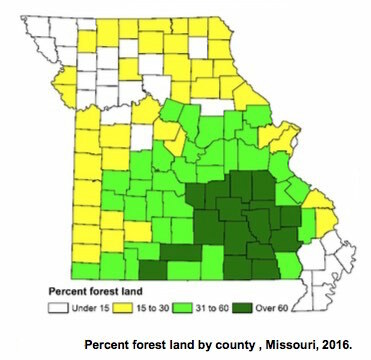 Forest resources in Missouri were unchanged in 2016, after more than 40 years of gradual increase, according to an estimate by the U.S. Forest Service. The estimate comes from the Missouri Forest Inventory, which is conducted annually. Data were collected from 7,524 individual forested plots across the state. Researchers surveyed how many trees of each species were located within the plot, and measured their height and girth. Researchers then extrapolated from this data to create a estimates for the whole state. Table 1. Source: Piva et al, 2017. Table 1 shows the data. In the table, “forest land” means land that is at least 10% covered by trees. “Timberland” means forest land that is capable of producing more than 20 cubic feet per acre per year of industrial wood crops. Compared to 2011, in 2016 the amount of forest land in Missouri decreased by 0.9%, the number of live trees decreased by 3.8%, the aboveground biomass of live trees increased 2.1% and the net volume of live trees increased 2.9%. 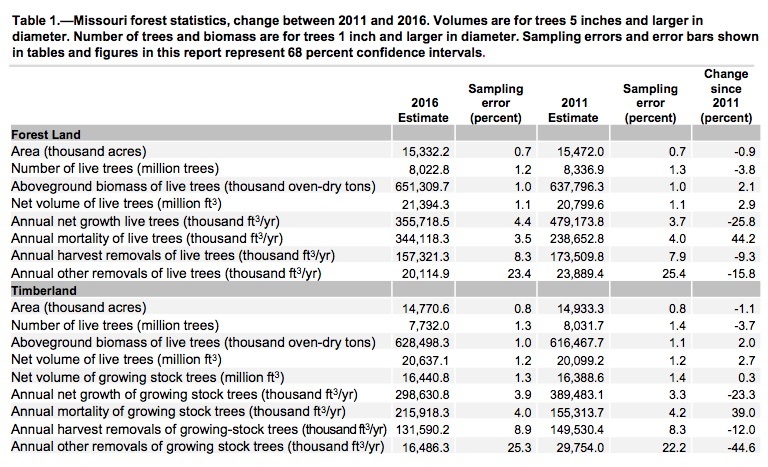 The area of timberland decreased 1.1%, while on timberland the number of live trees decreased 3.7%, the aboveground biomass of live trees increased 2.0%, and the net volume of live trees increased 2.7%. All of these changes were either within or just outside the margin of error. Thus, while there may be some very slight change between 2011 and 2016, it appears to have been small. Figure 1. Area of Forest Land and Timberland in Missouri by Year. Source: Piva and Trieman 2016. At the time of first settlement Missouri had an estimated 31 million acres of forested land. By 1947, the year of the first forest inventory, it had decreased to 15.2 million acres. 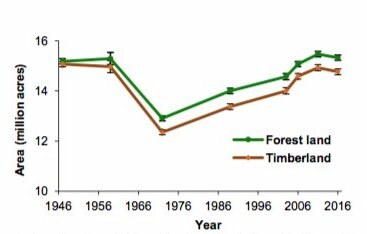 As shown in Figure 1, the area of both forest land and timberland bottomed in 1972, and over the next 40 years slowly rebounded to 1947 levels. Figure 2. Source: Piva et al, 2017. 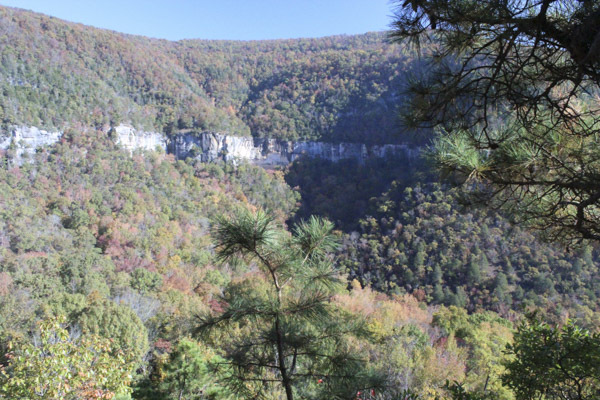 As shown in Figure 2, the Eastern Ozarks is the most heavily forested area in the state, with the remainder of the Ozarks next most heavily forested. Figure 3. Percent of Tree Species on Missouri Forest Land. Source: Piva et al, 2017. 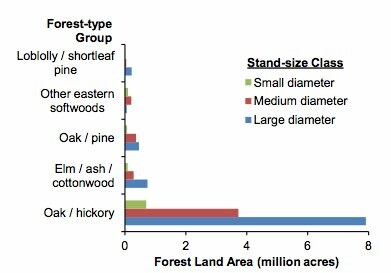 As shown in Figure 3, Missouri’s forest lands are predominantly oak-hickory forests. 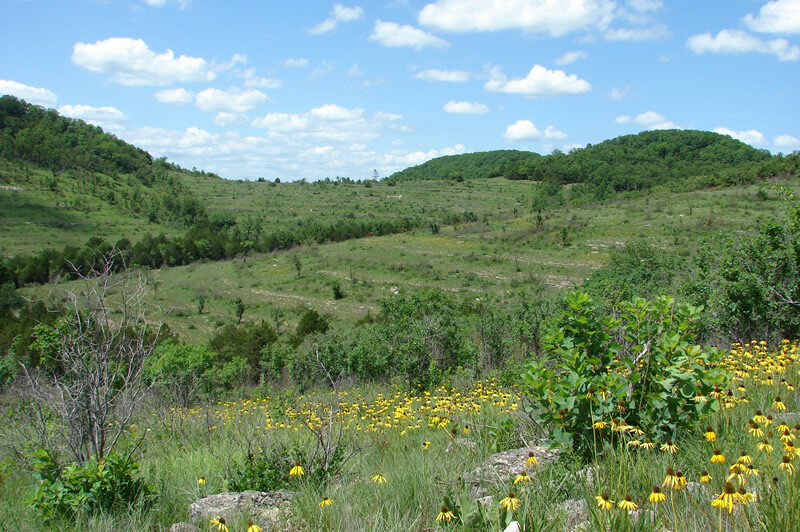 The extent of Missouri’s forest land, and the raw amount of forest that it supports is one factor in assessing the health of Missouri’s forests, but there are other factors as well, such as the presence of invasive nuisance species, the land’s ability to support animal and bird life, the presence of toxins, and the health of the trees on the land. I have discussed some of those issues in this blog, and those who are interested can find the relevant posts under the Land and Water menus at the top of the page. Piva, Ronald and Thomas Treiman. 2017. Forests of Missouri, 2016. Resource Update FS-120. Newtown Square, PA: U.S. Department of Agriculture, Forest Service, Northern Research Station. https://doi.org/10.2737/FS-RU-120. Figure 1. The triple bottom line. There is no generally accepted definition of urban sustainability. A recent report issued by the National Academies of Sciences, Engineering, and Medicine defines it as “the process by which the measurable improvement of near- and long-term human well-being can be achieved” in three areas: environmental, economic, and social. 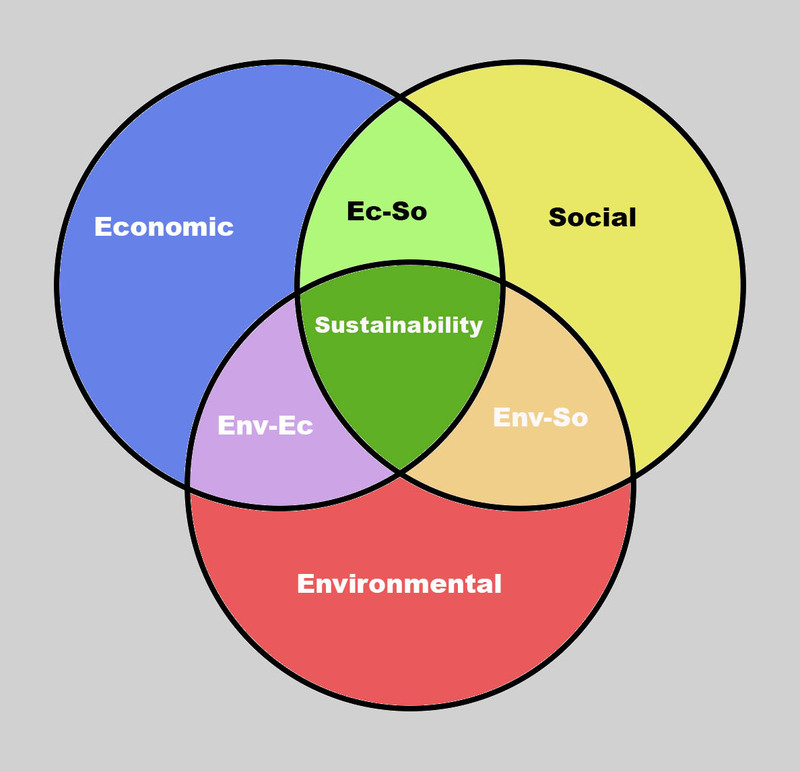 These three areas constitute the “triple bottom line” we hear so much about these days. The report conceptualizes them as combining to represent urban sustainability as illustrated in Figure 1 at right. By mentioning “near- and long-term” welfare, the report points to a popular conceptualization of sustainability: not compromising future welfare in the pursuit of short-term goals. Figure 2. Top National Priorities. Source: Pew Center for Research. This blog typically focuses on the environmental part of sustainability. Research consistently indicates that, while a large majority of Americans favor protecting our environment, they consistently rank its importance below other national priorities. 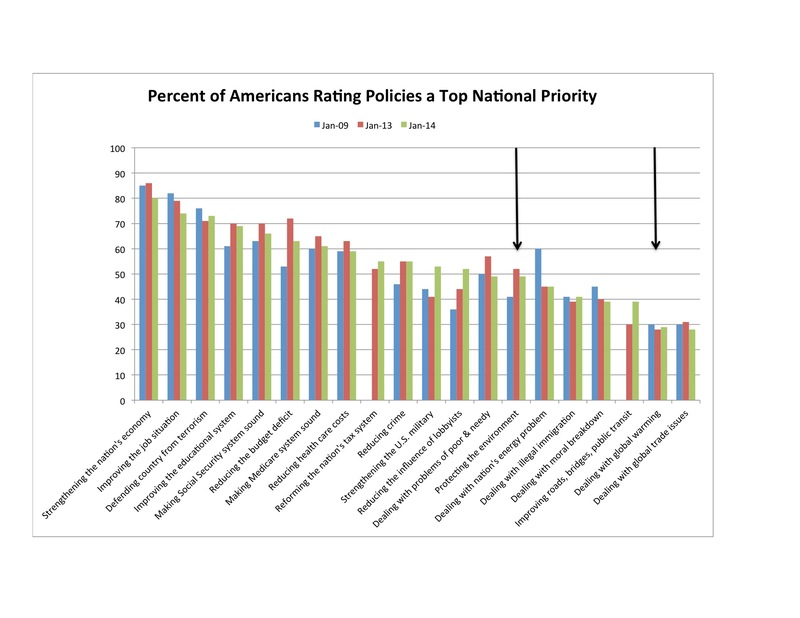 For instance, Figure 2 shows the results of Pew Research Center polls asking Americans to rate which issues should be top policy priorities. The chart shows that out of 20, protecting the environment ranks 14th, and dealing with global warming ranks 19th. Polls in 2009 and 2013 had similar results. I feel that the capacity of the planet to support life should not be a low priority; I focus on it because it is neglected. The specific urban processes that might underly urban sustainability are still under conceptual development. The real purpose of the report is to review that work. It looks at 4 sustainability rating systems that have been developed: the American Green City Index (EIU, 2011), the Urban Sustainability Indicators (Mega and Pedersen, 1998), The Sustainable Cities Index (Arcadis, 2015), the Sustainability Urban Development Indicators (Lynch et al., 2011). In addition, the report develops its own rating metrics by looking at 9 North American urban centers, plus the United States itself, to see what systems are being monitored, and which specific indicators are being used to monitor those systems. The 9 cities are Cedar Rapids, Chattanooga, Flint, Grand Rapids, Los Angeles, New York, Philadelphia, Pittsburgh, and Vancouver. Table 1. Environmental Indicators. Source: National Academies. Table 1 at right shows the results of the review. 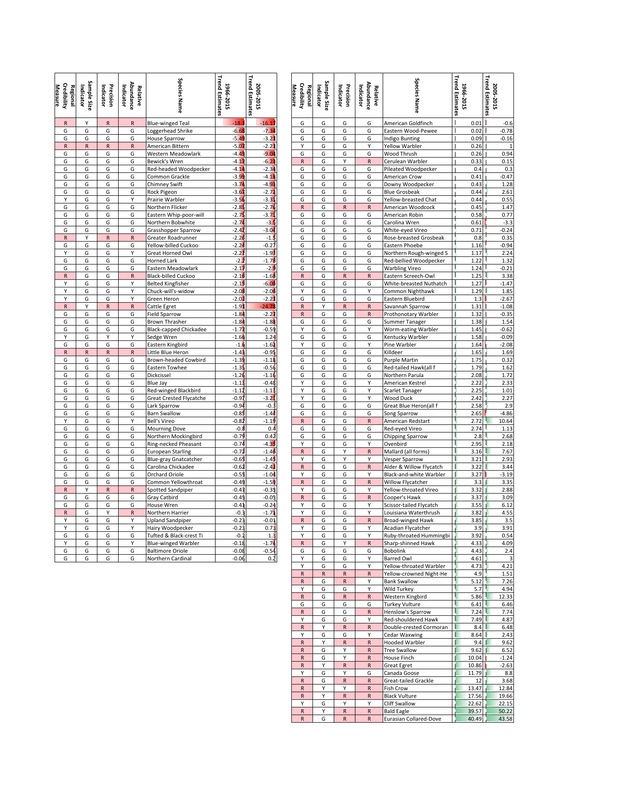 I have adapted the table to focus only on the environmental indicators, and to eliminate the scholarly references. If you are interested in this conceptual work, then the report would make important reading. I suspect than many readers of this blog, however, want to know what the results are: which cities rate as sustainable, and which don’t. As I said, the metrics are still under conceptual development, and I could find only one rating system that has actually been applied to cities in the United States: the US and Canada Green City Index. They rate 27 North American cities using their system. They provide separate ratings on policies related to CO2 emissions, energy mix and consumption, land use, green buildings, green transportation, water consumption and purity, waste management, air quality, and environmental governance. They also combine it all into an overall index. Figure 3. Source: Economist Intelligence Unit. Figure 3 shows the results for the overall index. St. Louis is the only urban area in Missouri represented, and it comes in 26th out of 27; only Detroit ranks lower. The index values have no specific meaning other than as a score on this particular index. Thus, absolute values probably have no interpretable meaning. They probably do have relative meaning, however, in comparison to each other. What disturbs me is not that St. Louis is low on the scale, anybody familiar with the city would suspect as much, but with how far behind the city is. In considering this chart, please be aware that the index was not constructed by an academic or governmental body. It was developed by the Economist Intelligence Unit (a part of The Economist Media Group) in cooperation with Siemans AG (a German corporation). This does not mean its conclusions are invalid, but it may mean that their work hasn’t undergone the review processes that academic and governmental publications do. Arcadis. 2015. Sustainable Cities Index 2015: Balancing the Economic, Social and Environmental Needs of the World’s Leading Cities. Available at https://s3.amazonaws.com/arcadis-whitepaper/arcadis-sustainable-cities-index-report.pdf. Economist Intelligence Unit. 2010. 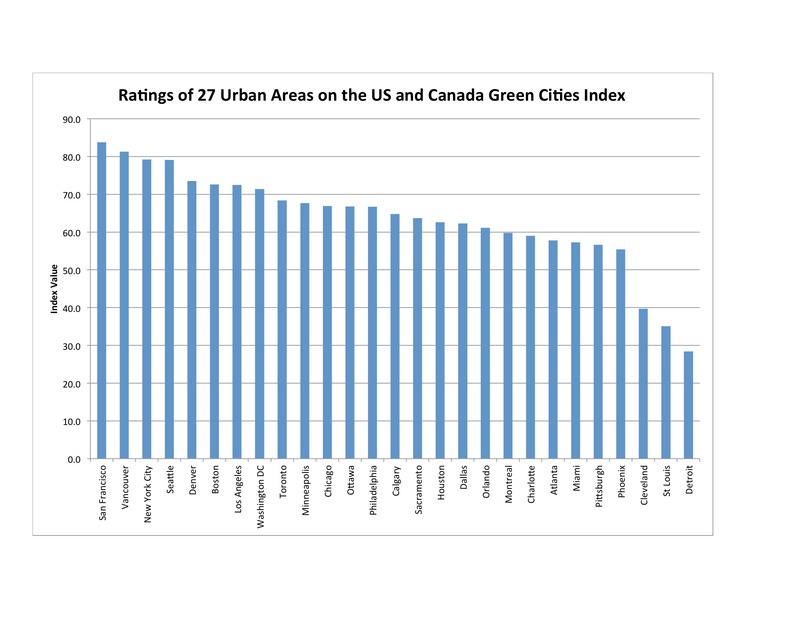 US and Canada Green City Index. Munich, Germany: Siemens AG. Downloaded 2/26/17 from http://www.siemens.com/greencityindex. Lynch, A. J., S. Andreason, T. Eisenman, J. Robinson, K. Steif, and E. L. Birch. 2011. Sustainable Urban Development Indicators for the United States. Report to the Office of International and Philanthropic Innovation, Office of Policy Development and Research, U.S. Department of Housing and Urban Development. Philadelphia: Penn Institute for Urban Research. Online. 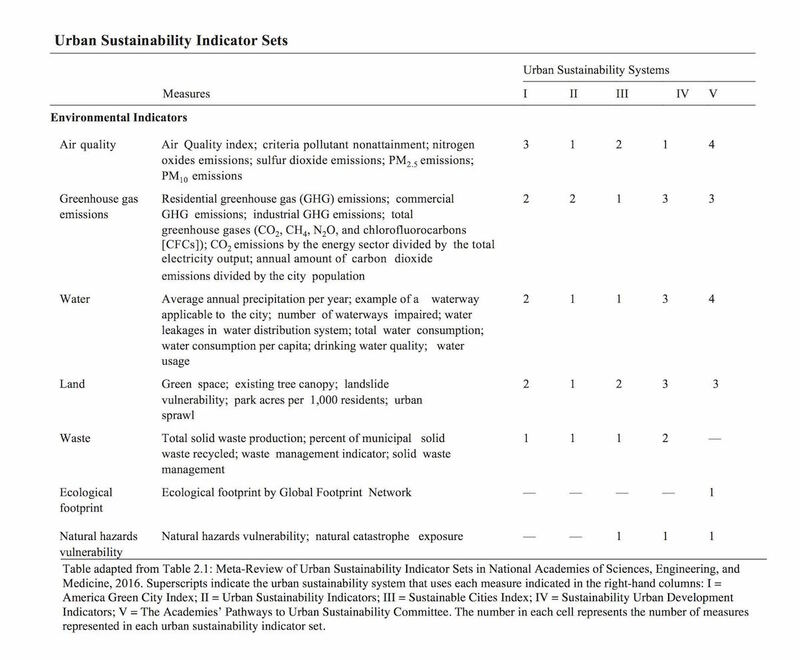 Available at http://penniur.upenn.edu/ uploads/media/sustainable-urban-development-indicators-for-the-united-states.pdf. Mega, V., and J. Pedersen. 1998. Urban sustainability indicators. Dublin, Ireland: European Foundation for the Improvement of Living and Working Conditions. Online. Available at http://www.eurofound.europa.eu/sites/default/files/ef_files/pubdocs/1998/07/en/1/ef9807en. pdf. National Academies of Sciences, Engineering, and Medicine. 2016. Pathways to Urban Sustainability: Challenges and Opportunities for the United States. Washington, DC: The National Academies Press. doi: 10.17226/23551. Downloaded 1/12/2017 from http://www.nap.edu/23551. During the last decade, a huge increase in the number of earthquakes striking the Midwest has been reported, especially in Oklahoma. Despite the presence of the New Madrid Fault, historically this part of the country has not been known to produce large numbers of earthquakes. There has also been an uptick in earthquakes in Arkansas, and I have been tracking the yearly number of earthquakes in Missouri. The last time I looked (here), I looked at data through 2014. This post updates the data through 2016. 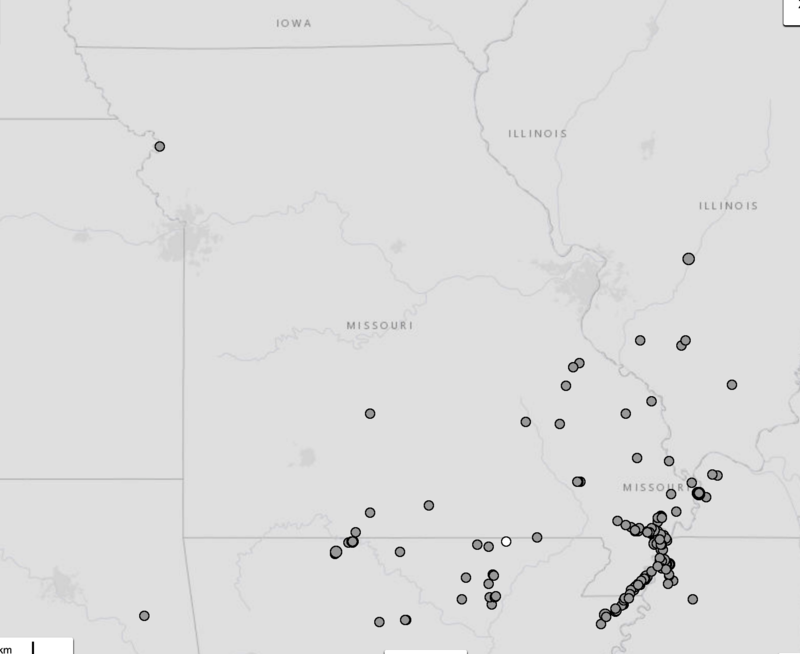 The U.S. Geological Survey database is not categorized by state, so I have been following earthquakes of magnitude 2.0 or greater in a rectangle that approximates Missouri. The precise boundaries are given in the Sources list. Figure 1. Data source: U.S. Geological Survey. The data are in Figure 1. It shows that the number of earthquakes continued to increase through 2015. The chart forms a rather dramatic spike, with the number of earthquakes in 2015 being more than 5 times as many as the number in 2012. The number was somewhat smaller in 2016. The vast majority of these earthquakes are small. In 2016, only 2 were larger than magnitude 3.0, and none were larger than magnitude 3.5. In 2015, 5 were larger than magnitude 3.0, and one was larger than magnitude 3.5. It occurred on April 2, 2015, and was measured at magnitude 3.6. 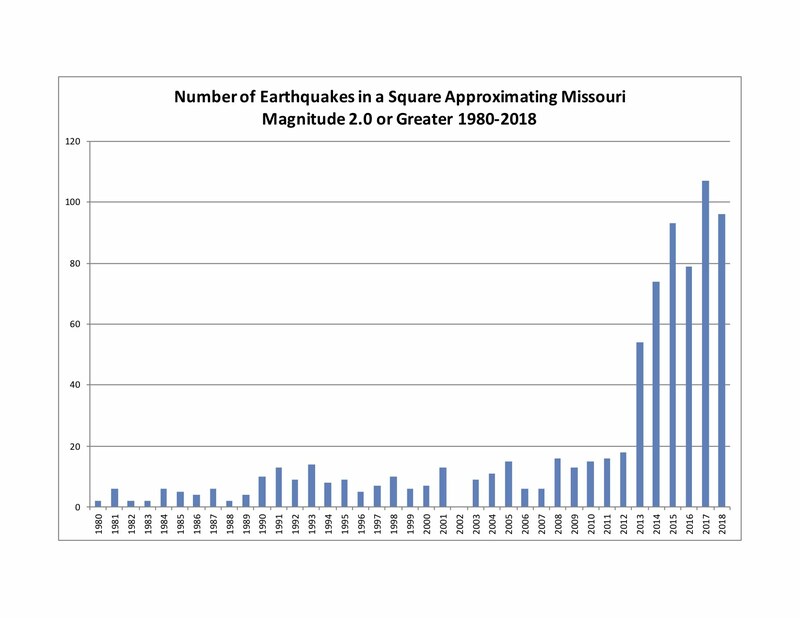 According to the Missouri Department of Natural Resources, the famous New Madrid Earthquake was actually a series of 3-5 major quakes of magnitude 7.0 or larger, and several thousand smaller ones. Major earthquakes are also believed to have occurred in southeastern Missouri around the years 300, 900, and 1400 C.E. Figure 2. Map showing earthquake locations, 2015-16. Source: U.S. Geological Survey. Figure 2 is a map showing the location of the earthquakes counted above in 2015-2016. It is easy to see that they cluster along the New Madrid Fault in southeast Missouri. The second largest group extends across northern Arkansas. 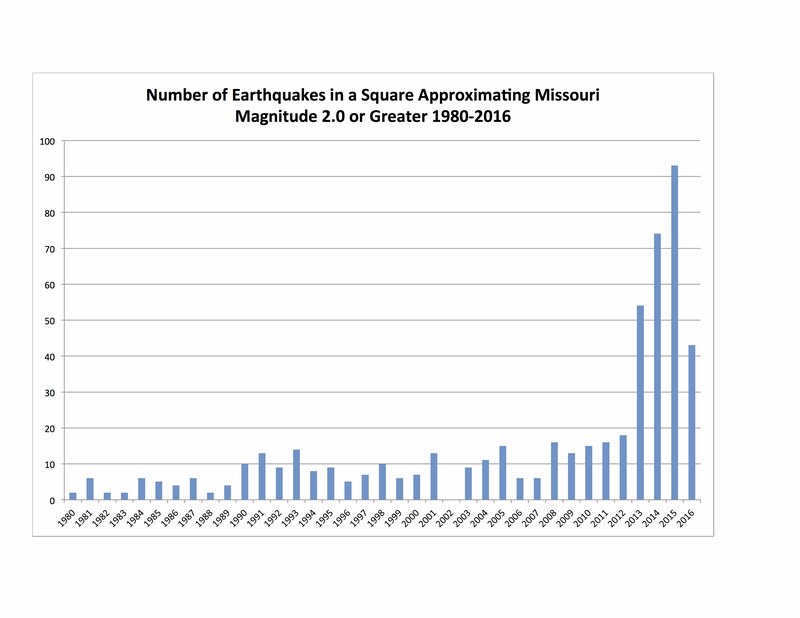 I don’t know why Missouri is experiencing this increase in small earthquakes, or whether 2016 signals that the increase is ending, and the numbers will return to those typical of the years before 2012. 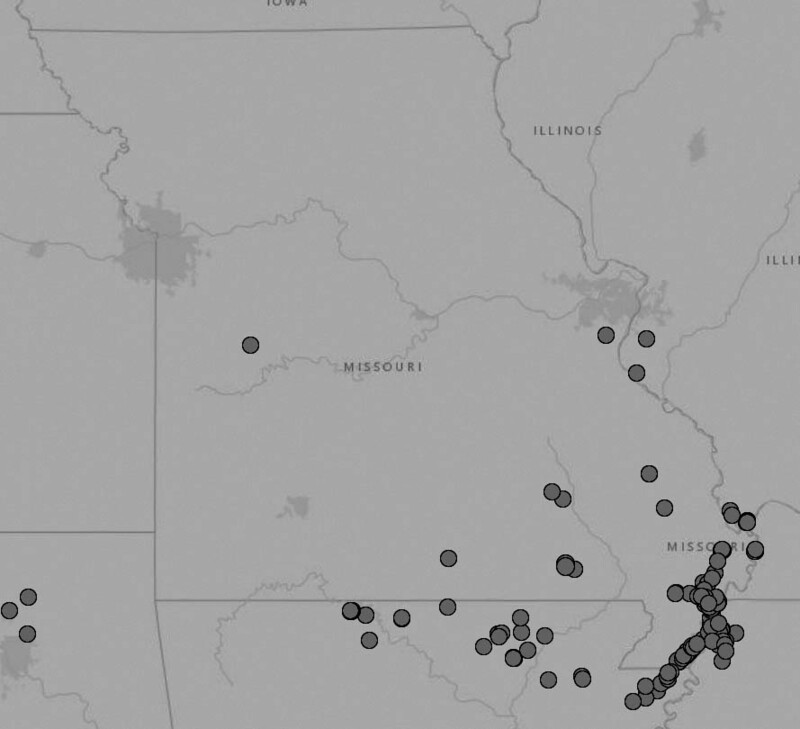 The swarm of earthquakes in Oklahoma has been attributed to the deep well injection of wastewater from fracking, but there is virtually no fracking in Missouri, and Missouri has no deep well waste injection sites. There are fracking operations in Arkansas, but they run through the center of the state from Conway west to Oklahoma. They are not particularly close to the New Madrid area. Climate change has more than doubled the yearly area burned by wildfire in the United States. In the decade from 1985-1994, wildfire burned 3,041,549 square miles in the USA. In the decade from 2006-2015 it burned 6,991,669 square miles – more than twice as much (see Wildfires Growing in Size, Not Number). But the number of fires has not greatly changed, rather the size of individual fires has grown. My findings parallel the results of several scientific studies and also field reports from the fire fighters themselves: wildfires, especially in southern and western mountain regions, have grown larger and more fierce. Why? Using data to explore the change is complicated by the fact that the human response to wildfire has changed: instead of suppressing every fire as rapidly as possible, some are allowed to burn to fulfill their natural role in the forest ecosystem. It was during the 1960s that evidence of the beneficial role of fire began to accumulate, and it was during the 1970s when a change in policy began to be discussed. 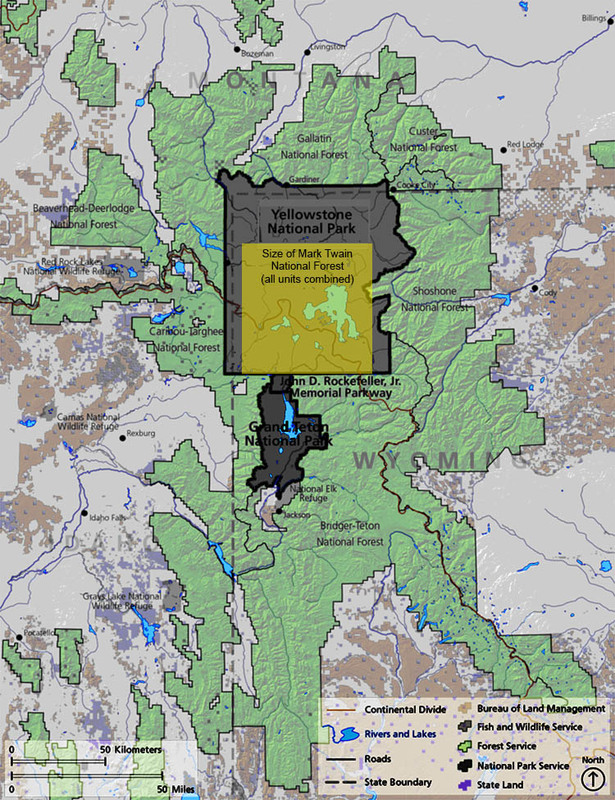 Yellowstone was the test site for the new policy, and it was phased in during the early 1980s. The terrible fires of 1988 changed all that, and the policy was suspended for review. It was reinstated during the early 1990s, and then it spread to other regions of the country The result was that the change occurred gradually, and not everywhere at the same time. The mid-1980s through 1990s are precisely the time of greatest increase in wildfire size. Thus, it is possible that part of the reason relates to the change in fire suppression policy. I know of no way to untangle that possibility from the data. The change in policy notwithstanding, two other explanations are generally put forward to explain the increase: a build-up in fuel load due to the nearly century-long policy of suppressing wildfire, and climate change. The most recent studies suggest both play a role. In Renewal by Fire I described how lodgepole pine forests age and become unhealthy if all fires are suppressed. To release their seeds, they require fire to melt the resin sealing their pine cones shut. In the absence of fire, little grows on the forest floor. Instead, downed timber builds up, forming conditions that are ripe for a large, destructive fire. Other western forests, dominated by species such as ponderosa pine or piñon pine, have different dynamics, but the effect is much the same: in the total absence of fire, fuel builds up, making conditions ripe for a severe, destructive fire. Figure 1. 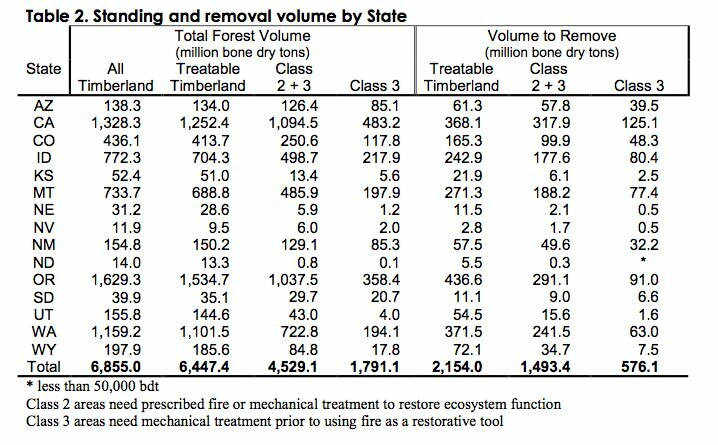 Biomass Volume in Western States. Source: Rummer et al. 2003. 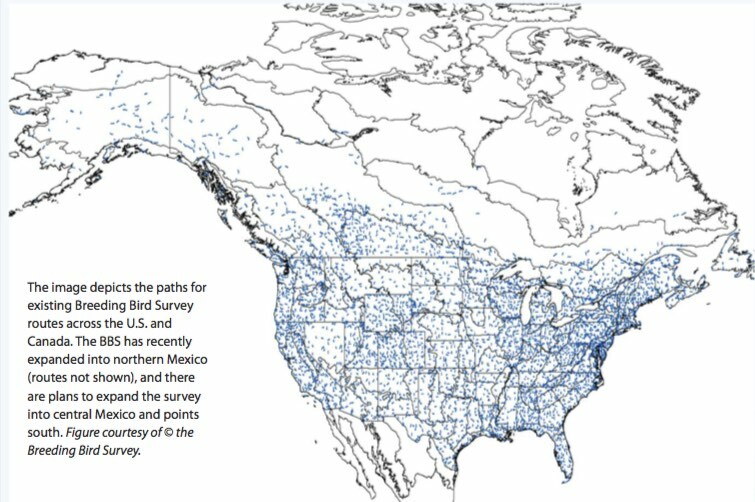 I could find no studies that compare the fuel loads in America’s western forests over time. I did find one study that suggested that across 15 western states there were 6.9 billion bone dry tons of fuel in the forests, of which 2.2 billion (32%) should be removed. This assessment counted not only debris on the forest floor, but also trees that should be thinned. Figure 1 shows the data. There may be questions about this explanation, however. The near-century of fire suppression would lead to a gradual build-up in fuel load over the entire period, rather than a sudden spike in the 15 years from 1985-2000. In addition, in recent years some fires have burned through areas burned in previous fires. For instance, this year’s Maple Fire in Yellowstone National Park partially burned through areas that burned in the North Fork Fire of 2008. Until recently, fires had difficulty burning through areas that had burned previously, there just wasn’t enough fuel. Not so in recent years. Thus, a build-up of fuel load due to fire suppression doesn’t fit the shape of the data well, and it doesn’t account for some recent fire behavior. Weather (short-term) and climate (long-term) are typically thought to be the most significant controls over the number, size, and ferocity of wildfires. As noted in Smokers, Smolders, and Big Blowups, it is when fuel becomes very, very dry that the fire danger becomes most extreme. Fires start more easily, and they wait only for a windy day to become raging infernos. Climate change can dry the fuel in forests three ways: it can result in less precipitation, it can cause the snowpack to melt earlier, leading to a longer dry season, and it can raise the temperature, causing the moisture in the forest to evaporate faster. All 3 seem to be occurring. 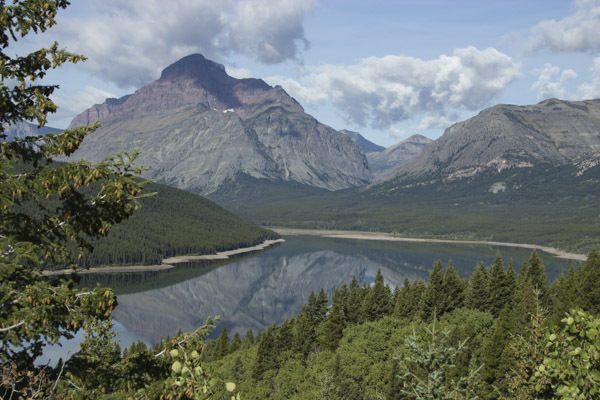 There are no data regions that correspond precisely with the areas of Wyoming and Montana that include Glacier, Yellowstone, and Grand Teton National Parks. Instead, I will share data from sub-regions and/or specific locations that we can take as representative of the whole area. I am not interested in when the snow is melting the most, however. I’m interested in the date at which snow no longer covers the ground, and thus, is no longer available to moisten the ground. I know of no data set that reports this information. 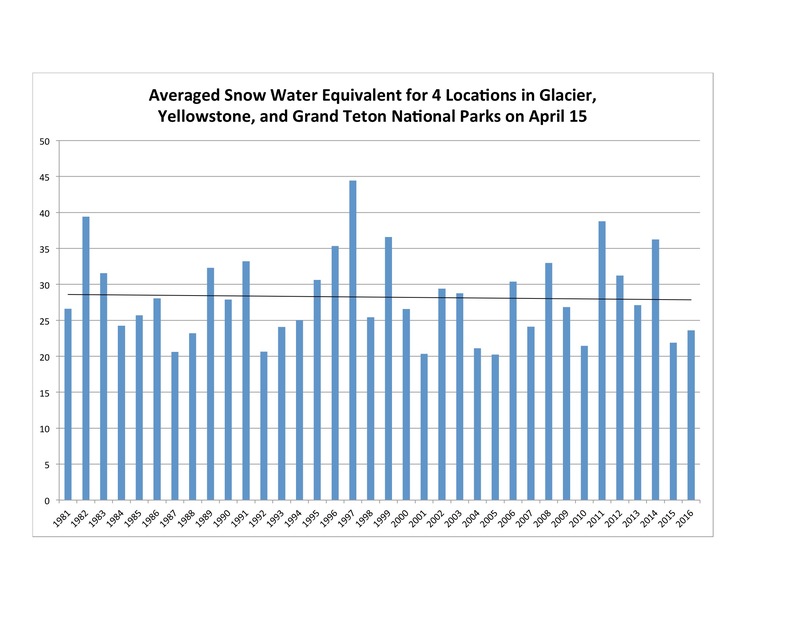 Instead, I have selected a date late in the season – April 15 – and looked at the snowpack on that date over time. If there is less snow on the ground late in the season, it probably indicates an earlier date when the snowpack is gone and the dry season begins. Figure 2. Snowpack at 4 Locations in the Northern Rockies. Source: Natural Resources Conservation Service. Figure 2 shows the data. Because the amount of snow can vary greatly according to local variables, I have taken measurements from the SNOTEL stations at Grassy Lake in Grand Teton National Park, Beartooth Lake in Yellowstone National Park, Emery Creek in the lowlands of Glacier National Park, and Flattop Mountain in the highlands of Glacier National Park. I have averaged the readings from 1981-2016, 1981 being the earliest measurement at two of these locations. The blue columns represent the actual data, and the black line represents the trend. You can see that since 1981 the average snowpack at these locations has declined, but the change is very small: -0.02 inches per year. Since the chart covers 36 years, that represents a change of -0.72 inches, or 3%. It suggests that the snow free date may have shifted a few days earlier, but by itself it is probably not a large enough change to account for the increase in fire. 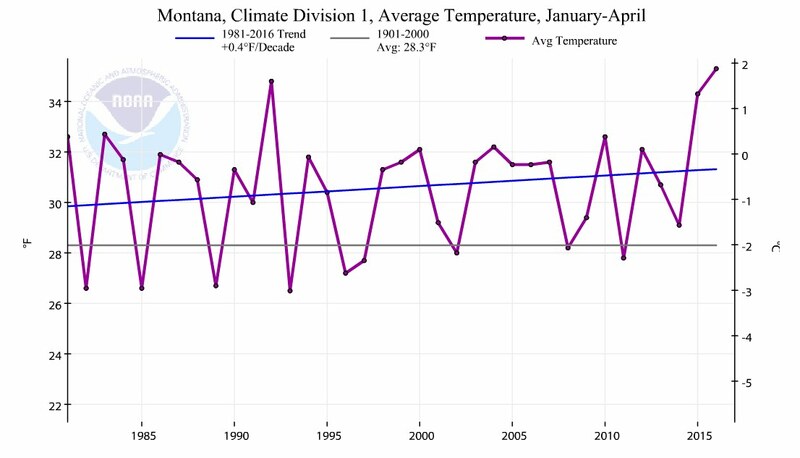 Figure 3 shows the annual average winter temperature in Western Montana from 1981 to 2016. 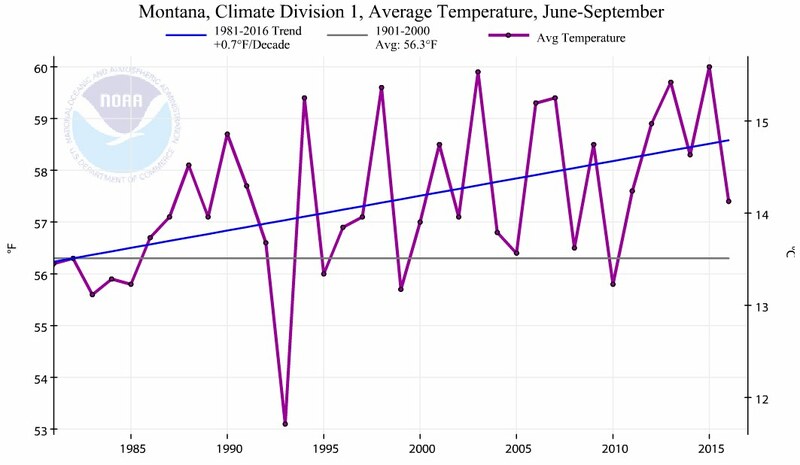 Figure 4 shows similar data for summer. The purple lines show the actual readings, the blue lines show the trends. You can see that the winter temperature has increased significantly, at a rate of 0.4°F per decade. You can also see that the summer temperature has increased even more, at a rate of 0.7°F per decade. That is a very large change for such a fundamental climate variable. Figure 5. Winter Temperature in Western Montana. Source: Climate at a Glance. Figure 6. Summer Temperature in Western Montana. Source: Climate at a Glance. 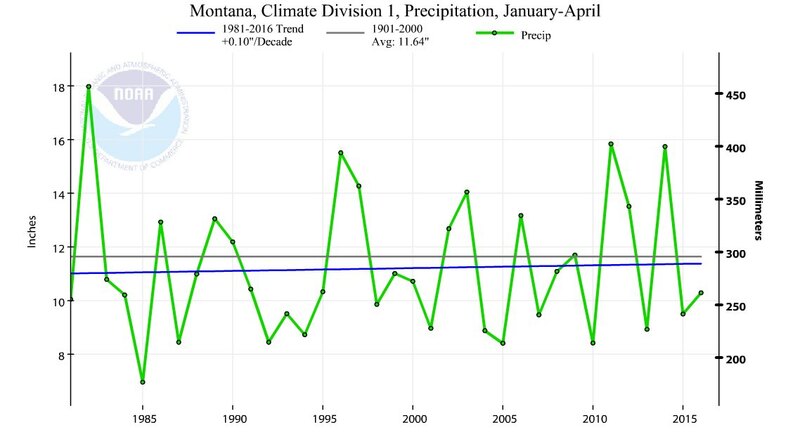 Figure 5 shows the total winter precipitation in Western Montana from 1981 to 2016. Figure 6 shows similar data for summer. The green lines show the actual measurements, the blue lines show the trends. During winter, precipitation has increased marginally, at a rate of 0.10 inches per decade. 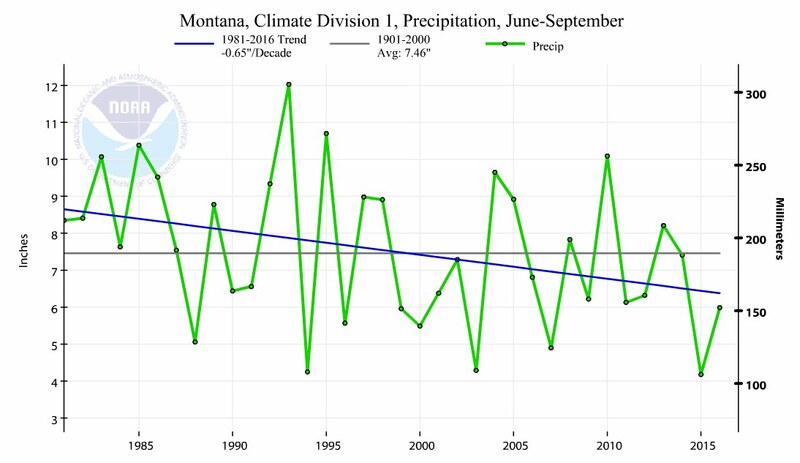 However, during summer, precipitation has declined at a much higher rate: -0.65 inches per decade, about 6.5 times larger than the winter increase. Figure 3. Winter Precipitation in Western Montana. Source: Climate at a Glance. Figure 4. Summer Precipitation in Western Montana. Source: Climate at a Glance. The data suggest that precipitation in the region may have increased slightly during the winter, but it has decreased significantly during the summer. During both periods, the temperature has increased significantly, with the larger increase occurring during summer. The effect would be that reduced summer precipitation and increased temperature would result in significantly drier conditions during the summer. In addition, the higher temperature would affect fire conditions by raising the ambient temperature. This is probably a less important factor than dryness, but it is significant nonetheless. Thus, we would expect fire season to begin earlier, as the forest dries earlier in the year, and we would expect that as the fire season goes on, fires behavior would become extreme, as the forest becomes extremely dry and hot. And this seems to be what has happened. 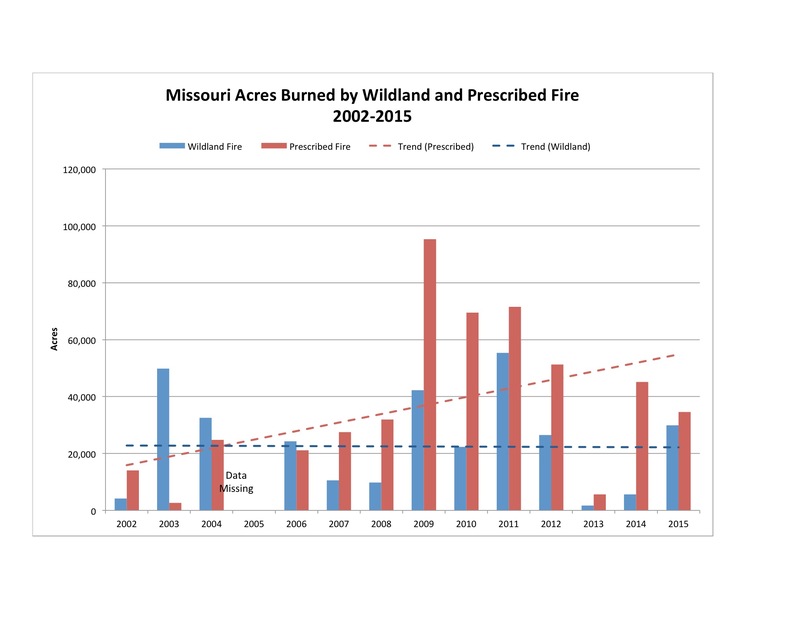 As noted in the previous post, data suggests that wildfire acreage burned in Missouri may not have increased in the same way it has in the western forests. Some data suggests that there has been an increase, but other data suggests that the increase comes from an increase in prescribed burns, not from nature-caused fires. In general, Missouri wildfire requires a human cause and human intervention to spread. Thus, it is unlikely to be affected by climate change in the same way as is fire in the western forests. Abatzoglou, John, and A. Park Williams. 2016. “Impact of Anthropogenic Climate Change on Wildfire Across Western US Forests.” Proceedings of the National Academy of Sciences. Downloaded online 10/17/2016 from www.pnas.org/cgi/doi/10.1073/pnas.1607171113. National Interagency Fire Center. 2016. Total Wildland Fires and Acres. Data downloaded 10/3/2016 from https://www.nifc.gov/fireInfo/fireInfo_stats_totalFires.html. Rummer, Bob, Jeff Prestemon, Dennis May, Pat Miles, John Vissage, Ron McRoberts, Greg Liknes, Wayne Shepperd, Dennis Ferguson, William Elliot, Sue Miller, Steve Reutebuch, Jamie Barbour, Jeremy Fried, Bryce Stokes, Edward Bilek, and Ken Skog. 2003. A Strategic Assessment of Forest Biomass and Fuel Reduction Treatments in Western States. U.S. Forest Service. Downloaded 10/15/2016 from http://www.fs.fed.us/research/pdf/Western_final.pdf. Vautard, Robert, Julien Cattiaux, Pascal Yiou, Jean-Noel Thepaut, and Philippe Ciais. 2010.”Northern Hemisphere Atmospheric Stilling Partly Attributed to an Increase in Surface Roughness.” Nature Geoscience, 10/17/2010. DOI: 10.1038/NGE0979. Macmillan Publishers. Accessed online 10/14/16 from http://www.nature.com/articles/ngeo979.epdf?referrer_access_token=swKTAeDzYW4Kl15-TdbsINRgN0jAjWel9jnR3ZoTv0P_XZlZh9_0kSsrMp3iDVwubdoqNb5x1ysMj6Pi8WEDIGybf8d5YnWrK_K0z-rv-P5kg3zf4Xp2N303GmtI-sb1Pqxj-EgEPD2e8yP4zFLMB7MsVO75vxb45IdLL-6IGgaNxzUO-R2JVCJEQqMBo_ss1gYX8sILyKMpm8pnuA4OUXwG6FbEqe3OWYcb0RYdRPU%3D&tracking_referrer=www.nature.com. Westerling, A.L., H.G. Hidalgo, D.R. Cayan, and T.W. Swetnam. 2006. “Warming and Earlier Spring Increase Western U.S. Forest Wildfire Activity.” Science, 313:5789, pp. 940-943, 7/18/2006. Downloaded 10/17/2016 from http://science.sciencemag.org/content/313/5789/940.full.pdf+html. Wildfire statistics for Missouri confirm how different wildfire is here compared to wildfire in the national parks and forests of the Northern Rockies. 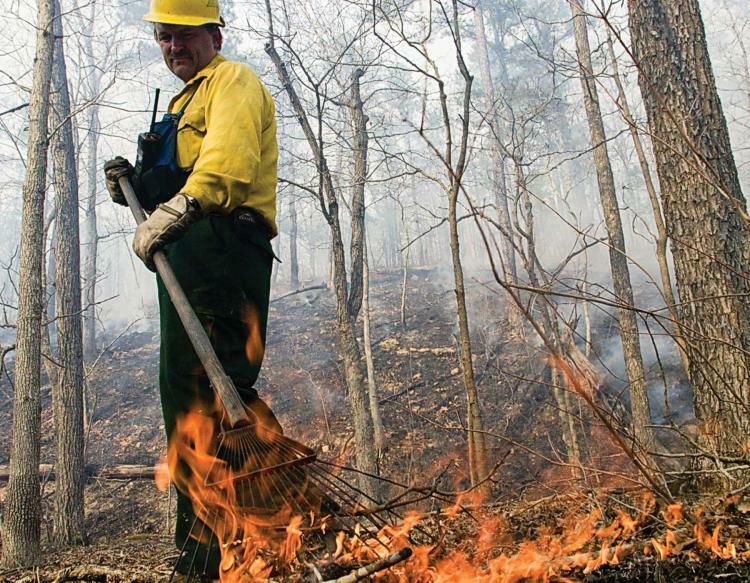 Wildfire statistics for Missouri are kept by two agencies: the National Interagency Fire Center (NIFC), and the Missouri Department of Conservation (MDC). Let’s look at the NIFC data first. Data source: National Interagency Fire Center. Most wildland fire in Missouri is either started by humans or requires human intervention to spread significantly (see previous post). The NIFC data calls fires that were not prescribed “wildland.” Figure 1 shows the number of square miles burned by wildland fire (blue) and prescribed fire (red). I have dropped linear regression trend lines on the data (the dashed lines). You can see that the number of acres burned in wildland fires has varied widely, from a minimum of 1,660 in 2013 to a maximum of 55,395 in 2011. The number of acres burned in prescribed fires has also varied widely, from a minimum of 6 in 2003 to a maximum of 95,268 in 2009. In contrast to much of the rest of the country, Missouri does not appear to be experiencing an increase over time in the number of acres that were burned in wildland fires – the trend is basically flat. For acres burned in prescribed fires, however, there was a significant increase until 2011, and since then the number of acres has slowly decreased. Over the 13 years with data, wildland fires burned an average of 24,209 acres per year, and prescribed fires burned an average of 38,078 acres per year. Thus, for every 2 acres burned by wildland fires, more than 3 were burned by prescribed fires. The number of acres burned by wildfire in Missouri is somewhat lower than in many western states. This year, 4 wildfires burning in Wyoming each burned more than 20,000 acres, and the Maple Fire by itself burned 45,425 acres. In California this year, the Soberanes Fire burned 132,127 acres. The fire data from the NIFC includes fires managed by federal agencies (in Missouri principally the National Park Service, the U.S. Fish and Wildlife Service, and the U.S.Forest Service). It also includes a subset of fires managed by state agencies, although what is included in the subset is not clear. MDC’s data seems to come from fire reports by local and regional fire departments. Those reports appear to be voluntary, and I couldn’t find any guidance about what the local departments file reports on. I did notice that the data included reports from departments that were the primary responders to fires, and from departments that were assisting responders to fires. Thus, there could be duplication in the data, as well as inconsistencies from year-to-year in the participating departments. It is also unclear what lands are included (state lands? private lands? developed lands? undeveloped lands?). For these reasons, I can’t use MDC’s data to indicate either the absolute number of fires in Missouri, nor their trend over time in acreage burned. The data do indicate the cause of the fires. Despite the possible inconsistencies in the data, it seems to me that they can be used to give a rough indication of the causes of fire in Missouri, especially if summed over a number of years. Data Source: Missouri Department of Conservation. 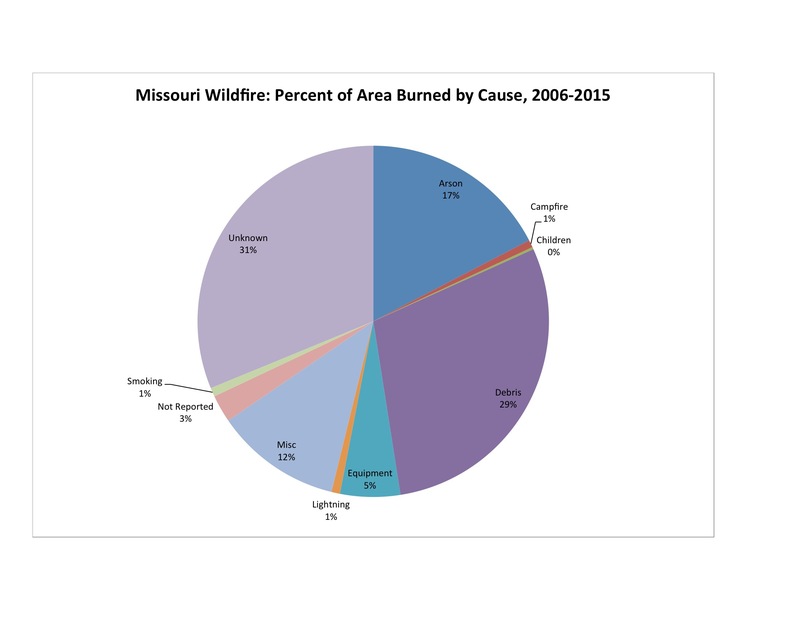 Figure 2 shows the percentage of Missouri fire from each cause from 2006-2015. The largest category is Unknown. After that, however, the largest category is Debris. This is where somebody burns something – a pile of brush they cleared from their land, some construction waste, etc. – and the fire escapes. The next largest category is Arson. Lightning accounts for only 1% of the fires counted by MDC. Dry lightning is common in the West (lightning from a thunderstorm that drops no rain), and it accounts for about 2/3 of western wildfires. It is rare in Missouri, however. In addition, Missouri’s overall climate is wetter and more humid. A lightning strike may cause a single tree to burn, but it rarely spreads into a significant fire. I wish that the Missouri Department of Conservation’s data included a description of what the data counts. Despite repeated attempts, the director of their fire program and I have been unable to connect with each other, so I haven’t been able to clarify it. The next post will explore why western wildfires have become larger and fiercer in recent years. InciWeb Incident Information System. This is a data portal. To find wildfires in Wyoming, I selected “Wyoming” in the “Select a State” data field, and clicked “Go.” Data viewed 10/31/2016 at http://inciweb.nwcg.gov. Missouri Department of Conservation. Wildfire Data Search. Data downloaded 10/31/2016 from http://mdc7.mdc.mo.gov/applications/FireReporting/Report.aspx. National Interagency Fire Center. Statistics > Historical Year-End Fire Statistics by State. Data downloaded 10/31/2016 from https://www.nifc.gov/fireInfo/fireInfo_statistics.html.